“Marine spatial planning and conservation need underpinning with sufficiently detailed and accurate seabed substrate and habitat maps. Although multibeam echosounders enable us to map the seabed with high resolution and spatial accuracy, there is still a lack of fit-for-purpose seabed maps. This is due to the high costs involved in carrying out systematic seabed mapping programmes and the fact that the development of validated, repeatable, quantitative and objective methods of swath acoustic data interpretation is still in its infancy. We compared a wide spectrum of approaches including manual interpretation, geostatistics, object-based image analysis and machine-learning to gain further insights into the accuracy and comparability of acoustic data interpretation approaches based on multibeam echosounder data (bathymetry, backscatter and derivatives) and seabed samples with the aim to derive seabed substrate maps. Sample data were split into a training and validation data set to allow us to carry out an accuracy assessment. “Ecosystem services provided by oceans and seas support most human needs but are threatened by human activities. Despite existing maps illustrating human impacts on marine ecosystems, information remains either large-scale but rough and insufficient for stakeholders (1 km² grid, lack of data along the coast) or fine-scale but fragmentary and heterogeneous in methodology. The objectives of this study are to map and quantify the main pressures exerted on near-coast marine ecosystems, at a large spatial scale though in fine and relevant resolution for managers (one pixel = 20 x 20 m). 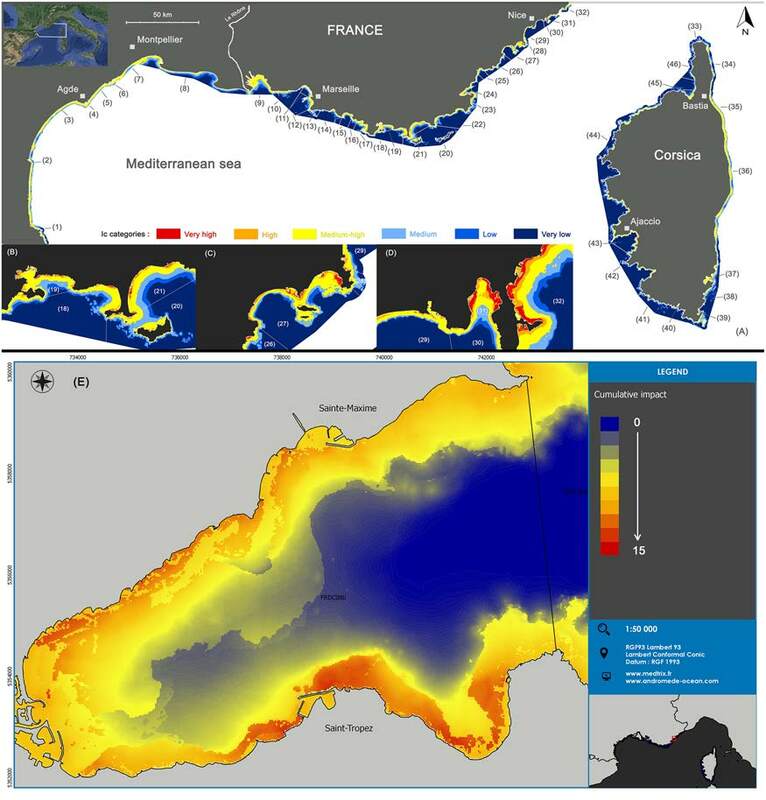 It focuses on the French Mediterranean coast (1,700 km of coastline including Corsica) at a depth of 0 to 80 m.
Spatial distribution of cumulative impact scores. (A) Spatial distribution of cumulative impact scores (IC) and localization of coastal water bodies. 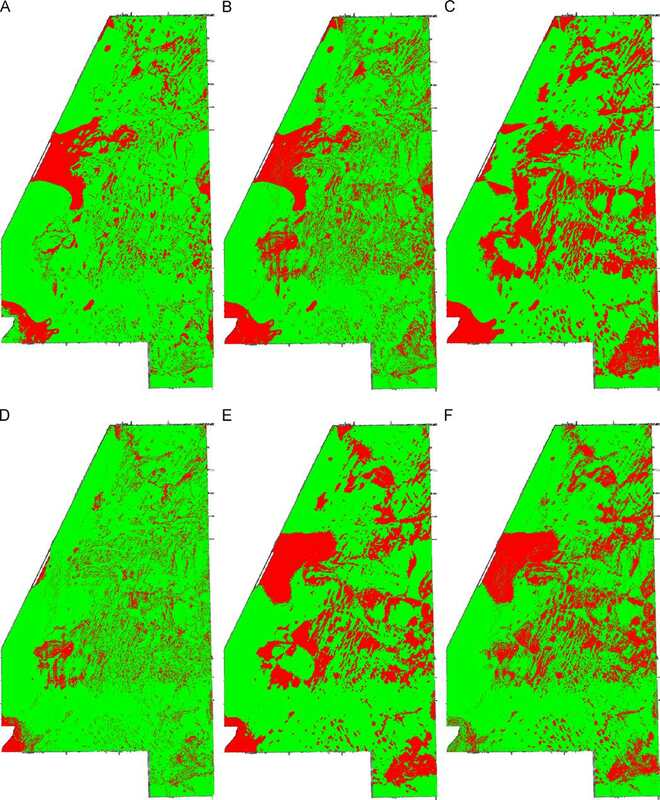 (B, C, D) Zooms showing how water bodies are more or less impacted (IC categories). (E) Detailed map of the Golfe of St Tropez showing how the golfe is impacted (quantitative IC scores) Several cities are indicated by small squares. 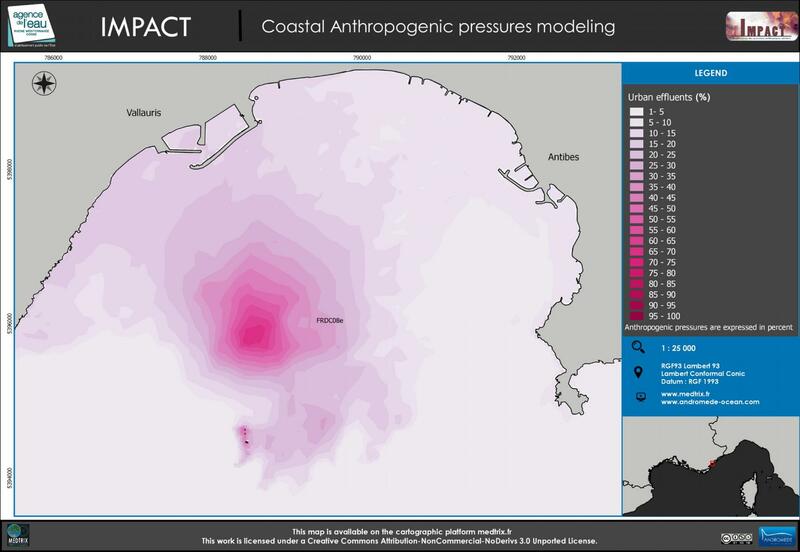 “After completing and homogenizing data presently available under GIS on the bathymetry and anthropogenic pressures but also on the seabed nature and ecosystem vulnerability, we provide a fine modeling of the extent and impacts of 10 anthropogenic pressures on marine habitats. The considered pressures are man-made coastline, boat anchoring, aquaculture, urban effluents, industrial effluents, urbanization, agriculture, coastline erosion, coastal population and fishing. A 1:10 000 continuous habitat map is provided considering 11 habitat classes. The marine bottom is mostly covered by three habitats: infralittoral soft bottom, Posidonia oceanica meadows and circalittoral soft bottom.